Walking through Madison, Wisconsin, hungry and hot, I stopped in my tracks when I came across what looked like a giant bird house next to the sidewalk. Through its glass door, I saw that it contained a small collection of books. Intrigued, I moved in for a closer look. The sign on the box said Little Free Library. It offered a simple, grassroots vehicle for sharing books. Borrow one, add one, whatever. What most warmed my bookworm heart, however, was the placard which read, “This Little Free Library is a gift from friends who wanted to PAY IT FORWARD. They hope you will do the same!” Books AND an anonymous good deed? Wow! I visited the website, littlefreelibrary.org, to learn more about this effort. There’s no big explanation, no grandiose vision for the world–just stories of individuals and libraries, punctuated by how-to tips. It really is just a grassroots effort to pay it forward. There’s even a locator to find all the spots where people have placed Little Free Libraries (more than 3000 around the US!). You may wonder why people would do this when most cities have their own public libraries. I can think of lots of reasons. It brings people together. It creates a sense of community and a way to give back. It accommodates travelers like me who don’t have credentials at every local library around the country. People can access these whenever they want. They can grab a book to occupy a busy toddler before entering a restaurant or borrow one to pass the time in a park. People can share books they love with others or explore a text they might not otherwise have discovered. Shall I go on? In any case, I think this is a wonderful idea. Not only does it appeal to my aforementioned bookworm heart, but it also shows that it doesn’t take a grand-scale effort to make a positive contribution to a community. Even if books aren’t your thing, I challenge you to use this example to consider ways you can pay it forward. 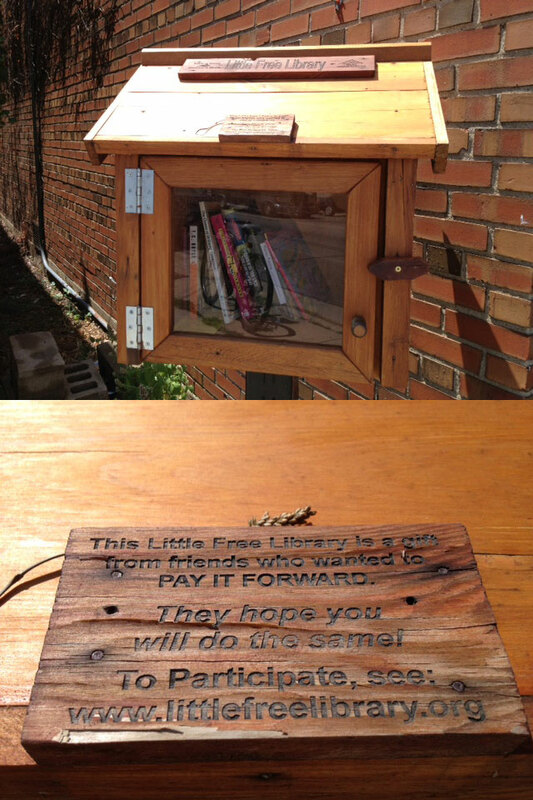 Like the Little Free Library, sometimes thinking small might be the way to get there. What a wonderful and adorable idea! 🙂 It seems magical somehow perhaps because of its size and how you can just come across them unexpectedly. And the fact that you can track them down with the map adds a slight treasure map aspect to them (or is that just me?). Thanks for letting us know about them! You are welcome! I was really excited to share this. And I agree with you; they do seem somehow magical. I would love to steward one of these myself. P.S. I love the treasure map spin you threw on the idea!